Upon further investigation, I found out that the Forbes article was based on an editorial published in the Annals of Internal Medicine. This editorial was not an original piece of research; it was, rather, several authors’ thoughts based on three very different studies evaluating the effectiveness of multivitamins in the prevention of chronic disease. So, I decided to read the original research for myself. The first study was conducted on patients who suffered from myocardial infarction. The study suggests that high-dose multivitamin supplementation will not reduce the possibility of a second hospitalization due to the recurrent myocardial infarction, stroke, coronary revascularization, or angina. The second study, conducted on male physicians aged 65 years or older, suggests that multivitamin supplementation will not have any effect on cognitive health. The third study was a review; after evaluating clinical trials, the authors found little evidence that multivitamin supplementation can prevent cardiovascular disease or cancer. Based on these three studies, is it appropriate to conclude that there is very little benefit of vitamin supplementation at large? I strongly argue that it is not. First, let’s take a look at the applicability of these studies. Do these studies address the common use of vitamin supplements and are they relevant to the general population? The first study focuses on people who already suffer from myocardial infarction. 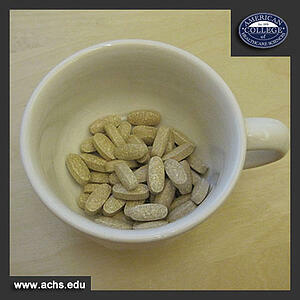 It suggests that multivitamin supplementation is unlikely to reduce the chance of a second one. I agree with these conclusions; the study is very sound. However, the study investigates a very specific application of vitamin supplementation that is of little relevance to the majority of readers. It is important to note that numerous studies have demonstrated that intake of dietary antioxidants reduces the risk of coronary heart disease, that vitamin D supplementation may reduce the risk of coronary heart disease, and that folate and vitamin B6 are important for the primary prevention of coronary heart disease among women. There is no contradiction between these studies. Rather, the study authors, Gervasio A. Lamas and colleagues, looked at a very narrow—very specific—group of population. Now, interestingly, the second study did not identify any benefit of multivitamin supplementation for cognitive health. This contradicts many other research results in the field. For example, a study involving Japanese-American men living in Hawaii suggests that vitamin E and C supplements may protect against vascular dementia and may improve cognitive function in late life. Another study conducted in Cache County (Utah) indicates that the combination of vitamin E and C supplements may prevent Alzheimer Disease. Similarly, a study involving Chicago residents demonstrates that vitamin E intake slows down cognitive decline with age. Note that the authors of this second study, Francine Grodstein and colleagues, focused their research on retired physicians. I will speculate that this group of people is much more likely to follow a healthy lifestyle and to consume vitamin-rich food products than people living in the Utah countryside or Chicago suburbs. They are better educated on the proper dietary choices and are capable of affording nutrient-rich foods. Due to their lifestyle, additional vitamin supplementation was likely not necessary for this group of people. This does not mean that supplementation is unnecessary for the general population. The third “study,” a research review article authored by Stephen P. Fortmann and colleagues, reviewed selected clinical trials and noted that the majority of trials did not identify anticancerogenic or cardiovascular-protective effects of vitamin supplementation. However, as I already mentioned, a number of studies have indicated the importance of vitamins for the prevention of coronary heart disease. Vitamin D deficiency is an established risk factor for the development of cardiovascular disease, and vitamin and mineral deficiency is thought to increase the risk of cancer. A recent meta-analysis provides strong evidence that vitamin D and calcium have a chemopreventive effect against breast cancer. Also, a large cohort study indicates that vitamin D intake results in a lower lung cancer risk for postmenopausal women who have never smoked. In addition, S.P. Fortmann et al. mentioned that compared studies varied considerably in principal aims, study design, and recruitment criteria, significantly raising the possibility of type II error—failing to recognize an effective treatment. Thus, although all three articles published in the Annals of Internal Medicine contain important scientific information on the specific use of vitamins, they do not provide a basis for the general statement that vitamins are ineffective. I can only conclude that more research involving statistically powerful studies is necessary. Adequate vitamin supplementation is essential for health. For example, a recent study demonstrated that vitamin D deficiency is very widespread among the U.S. population (41.6%), with an extremely high rate (82.1%) seen in non–Hispanic blacks. Deficiency rate is also still high for vitamin C (13% of the U.S. population) and other micronutrients (iodine, iron, zinc) with non–Hispanic blacks being a particularly vulnerable group. In this situation it is much more important to focus on proper diet containing nutrient and vitamin-rich foods, whole/unprocessed foods, organically grown fruits and vegetables—and to take vitamin supplements if these foods are unavailable. It is really sad that instead of mentioning this, Forbes published a speculative article that seems to be written by a journalist without careful investigation of primary sources. Montonen, J., et al. (2004). Dietary antioxidant intake and risk of type 2 diabetes. Diabetes Care, 27(2):362-366. Wang, H., et al. (2011). Vitamin E intake and risk of amyotrophic lateral sclerosis: A pooled analysis of data from 5 prospective cohort studies. Am. J. Epidemiol., 173(6):595-602. Guallar, E., et al. (2013). Enough is enough: Stop wasting money on vitamin and mineral supplements. Ann Intern Med., 159(12):850-851. Lamas, G., et al. (2013). Oral high-dose multivitamins and minerals after myocardial infarction: A randomized trial. Ann Intern Med., 159(12):797-805. Grodstein, F., et al. (2013). Long-term multivitamin supplementation and cognitive function in men: A randomized trial. Ann Intern Med., 159(12):806-814. Fortmann, S., et al. (2013). Vitamin and mineral supplements in the primary prevention of cardiovascular disease and cancer: An updated systematic evidence review for the U.S. preventive services task force. Ann Intern Med., 159(12):824-834. Hertlog, M., et al. (1993). Dietary antioxidant flavonoids and risk of coronary heart disease: the zutphen elderly study. The Lancer, 342(8878):1007-1011. Wang, L., et al. (2010). Systematic review: Vitamin d and calcium supplementation in prevention of cardiovascular events. Ann Intern Med., 152(5):315-323. Rimm, E., et al. (1998). Folate and vitamin B6 from diet and supplements in relation to risk of coronary heart disease among women. JAMA, 279(5):359-364. Masaki, K., et al. (2000). Association of vitamin e and c supplement use with cognitive function and dementia in elderly men. Association of vitamin E and C supplement use with cognitive function and dementia in elderly men, 54:1265-1272. Zandi, P., et, al. (2004). Reduced Risk of Alzheimer Disease in Users of Antioxidant Vitamin Supplements The Cache County Study. Arch Neurol., 61(1):82-88. Morris, M., et al. (2002). Vitamin E and cognitive decline in older persons. Arch Neurol, 59(7):1125-1132. Wang, T., et al. (2008). Vitamin d deficiency and risk of cardiovascular disease. Epidemiology, 117:503-511. Ames, B. & Wakimoto, P. (2002). Are vitamin and mineral deficiencies a major cancer risk? Nature Reviews Cancer, 2:699-704. Chen, P., et. al. (2010). Meta-analysis of vitamin D, calcium and the prevention of breast cancer. Breast Cancer Research and Treatment, 121(2):469-477. Cheng, T., et al. (2013). Vitamin D intake and lung cancer risk in the women. Am J Clin Nutr., 98(4):1002-1011. Forrest, K. & Stuhldreher, W. (2011). Prevalence and correlates of vitamin D deficiency in US adults. Nutrition Research, 31(1), 48–54. Schleicher, R., et, al. (2009). Serum vitamin c and the prevalence of vitamin c deficiency in the united states: 2003–2004 national health and nutrition examination survey (nhanes). Am J Clin Nutr., 90(5):1252-1263.